Philmor T5000 Series Rail Trailers are “traditional style” non-powered, 2-axle rail vehicles designed to be towed / propelled by a compatible vehicle. 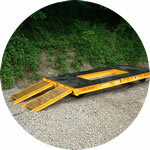 Featuring a low, flat deck with fixings along their sides for securing a variety of loads. axles give unrivalled ride quality and resistance to derailment. 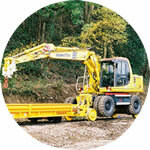 The 12 or 20 tonne capacity versions are available on standard 5m long chassis. Other load capacity variants and sizes (including 3.5 m 10 tonne capacity) available. 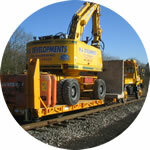 Fully compliant to Network Rail and LUL specifications. Variants with fully insulated and “gauge adjustable” axles available. 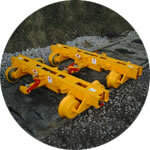 2 or 4 spring applied “failsafe” park brake units available with air or hydraulic operation – dependent on trailer payload required. Also available with dual air/hydraulic brake capability – for enhanced operational flexibility and capability. 6 tonne capacity 4 wheeled trolleys. 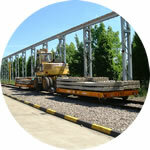 Fully compliant with Network Rail standard RIS-1530-PLT. 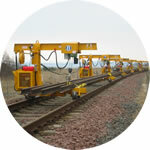 Can be combined together to carry long rail lengths. 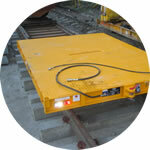 The range includes insulated units for use on electrified rail and tramways. Various load capacity and sizes available. 2 or 4 spring applied “failsafe” park brake units available with air or hydraulic operation. 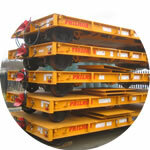 6 tonne capacity 4 wheeled trolleys can be combined together to carry long rail lengths. Crane version of 4 wheeled trolley used for carrying rail in consist with Unimog towing vehicle.